Students and staff hosted a packed programme of Remembrance activities to mark the 100th anniversary of the end of the First World War, and honour those who fought and died for our freedom. As part of the week-long programme of Remembrance, special assemblies were held to teach students more about the Great War, whilst there was also a poetry competition and poppy sales, which have raised around £160 for the Royal British Legion. A further £42 was raised for the Poppy Appeal in a raffle for a commemorative ‘Tommy’ figurine. Lectures were held during lunchtimes highlighting lesser-known facts about the war, including how Britain treated the men who refused to fight, how women kept the war effort going, how the country was aided by Canada, India and Australia, as well as the conflict from a German perspective. More than 120 people attended two screenings of Peter Jackson’s extraordinary film, They Shall Not Grow Old, which brings the frontline to life using remastered footage and the voices of the soldiers who were there. Students, staff and Parents/Carers also got creative to make their own plastic poppies using old drinks bottles, which have been used to form a stunning display outside the school’s front entrance. 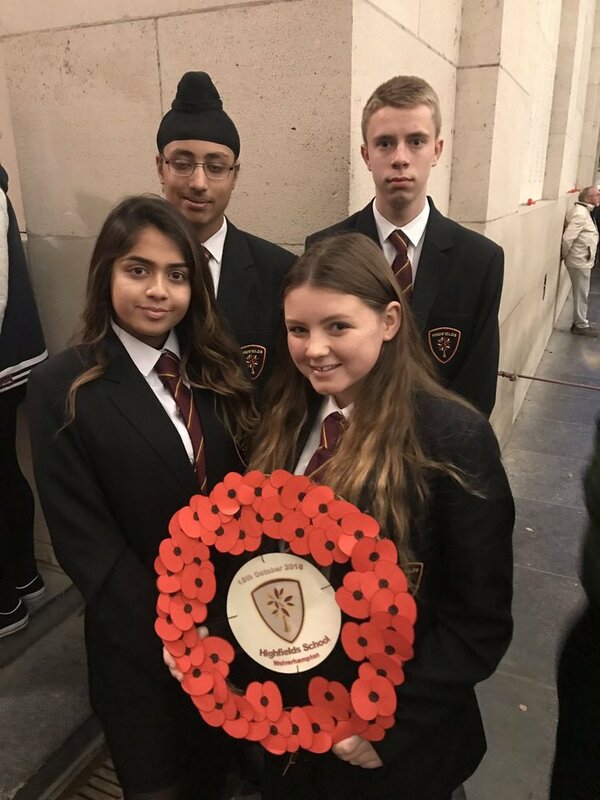 The Remembrance activities were staged after dozens of students travelled to Ypres - the location of three significant and devastating battles between 1914 and 1918 - to honour those who made the ultimate sacrifice. Miss J Tappenden, Highfields’ Head of History, said: “As this Armistice day marked 100 years since the end of the First World War we wanted to do something really special to mark the occasion, teach students about the horrific realities of the conflict, and honour those who fought and died. “We put on dozens of activities, including two screenings of Peter Jackson’s stunning film, They Shall Not Grow Old, held special assemblies and ran lectures which were really well attended. “We asked for students, staff and Parents/Carers to put their creative skills to good use to make plastic poppies for our display outside school, and we were overwhelmed with the response. The display looks stunning and is a fitting tribute to those who made the ultimate sacrifice - many who signed up to fight at the same age as some of our students are now. Posted on November 20, 2018 by Vicky Nash.